The samples I ordered for the Online Guild’s Silk Spinning workshop arrived yesterday! The workshop is in May. 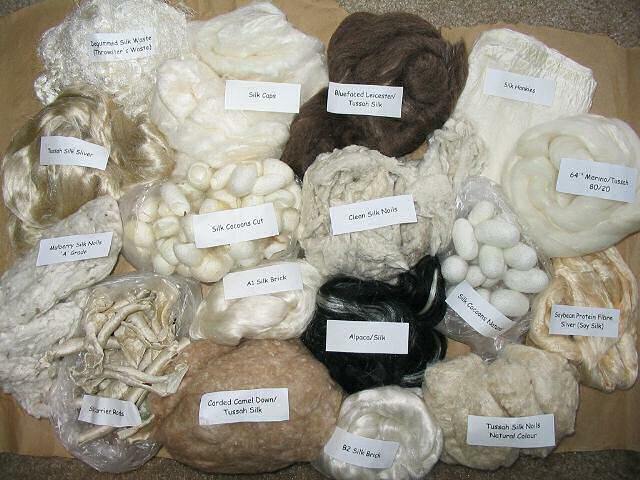 Starting at the top left and working across the rows: throwster’s waste, silk caps, Bluefaced Leicester/tussah silk blend, silk hankies, tussah silk sliver, cut silk cocoons, clean silk noils, natural silk cocoons, 64s merino/tussah silk 80/20 blend, mulberry silk noils (A grade), silk carrier rods, A1 silk brick, alpaca/silk blend, soy silk, carded camel down/tussah silk blend, B2 silk brick, and natural colored tussah silk noils.